A better effort, the same result. The Buffalo Sabres stayed with one of the top teams in the Western Conference for much of the game Tuesday night but Ryan Johansen's tie-breaking goal with 13:28 left gave the Nashville Predators a 3-2 win over the bedraggled Blue and Gold before an announced crowd of 16,569 in KeyBank Center. The Sabres (31-39-10) have lost three straight in regulation. They are 0-7-1 in their last eight games and 1-13-2 in their 16. The victory pulled Nashville (45-29-6) back into a tie for first place in the Central Division with Winnipeg, which lost to Minnesota. The Jets and Predators (96 points apiece) are two ahead of idle St. Louis. Nashville is 6-2-1 in its last nine games. There's no home cooking in the all-time series between these teams. The Sabres have beaten Nashville at home just one time since the Preds joined the NHL in 1998, posting a 1-8-4 mark against them (three overtime losses, one tie). They are 0-5-3 since the lone win, an 8-4 victory on Feb. 27, 2008. The winning goal came as Johansen roofed a backhand over Carter Hutton just ahead of the reach of Rasmus Ristolainen after collecting the puck off the end boards on a wide shot by Predators forward Viktor Arvidsson. Skinner snaps a slump: The stage was set for the third period when Sabres forward Jeff Skinner scored his 38th goal of the season with 4.6 seconds left in the second period to pull Buffalo into a 2-2 tie. It came on an almost identical play as the Johansen goal as Skinner potted Brandon Montour's wide point shot off the end wall and quickly swooped the puck past Nashville goalie Pekka Rinne. It was Skinner's first goal in nine games and just his second in the last 22. Strange opening goal: Nashville took a 1-0 lead at 8:49 of the first period on Craig Smith's deflection of a P.K. Subban shot. 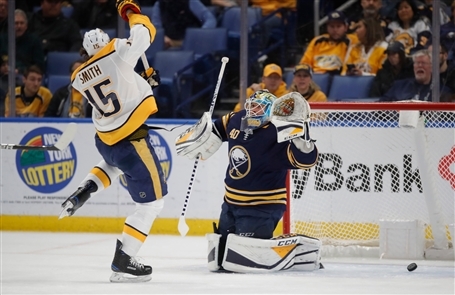 Replays showed the puck hitting the shaft of Smith's upraised stick between the hands and deflecting past Carter Hutton. The NHL Situation Room in Toronto ruled it a good goal, saying replays were "inconclusive" about the puck hitting Smith's stick. Strange tying goal: The Sabres got even at 16:04 of the first as Kyle Okposo slammed the puck into an empty net after Ristolainen's point shot hit Evan Rodrigues to the right of the goal and caromed into the empty crease. It was Okposo's 13th goal of the year. Taking the lead: Subban put Nashville into a 2-1 lead just 44 seconds into the second period with an elite-level goal. After knocking a Rasmus Dahlin pass out of midair, Subban sprinted down the ice with a clear path to the net. As he skated through the right circle, he blasted a slapshot by Hutton to put Nashville in front. 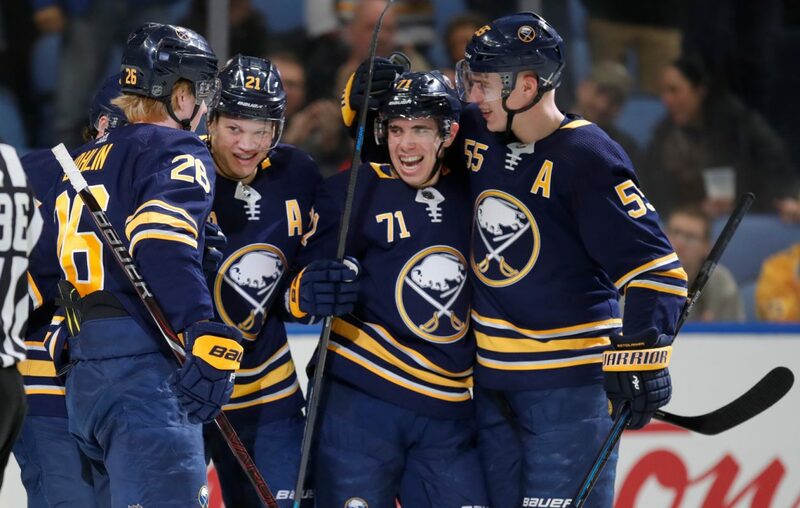 A second strange call: The Sabres appeared to tie the game at 2:40 as Conor Sheary slid a rebound under Pekka Rinne but the goal was wiped out on a delayed penalty call as Nashville's Ryan Johansen was called for hooking. The Sabres, however, were incensed because it did not appear any Nashville player possessed the puck to warrant a whistle. The play is not reviewable. The missing: Sitting out the game with injuries were defensemen Marco Scandella, Matt Hunwick and Zach Bogosian and forward Vladimir Sobotka. Defensemen Will Borgen and Matt Tennyson were healthy scratches as was forward Zemgus Girgensons. Coach Phil Housley said Scandella, who was hit in the foot by a shot in Saturday's game against the New York Islanders, has been shut down for the season and will also miss Thursday's game against Ottawa and Saturday's game in Detroit. Bogosian remains day to day and Hunwick skated Tuesday morning so they could play. Why not play Borgen? The rookie has looked good in his four games but is likely heading back to Rochester, as soon as Wednesday, to prepare for the Amerks' key home-and-home series this weekend against Syracuse. "I've really liked his play," coach Phil Housley said. "When you look at his shifts, positionally sound, very good defensively, has a really good gap and stick detail, and he moves the puck very well. It's a very simple game, very steady. " Up next: The Sabres practice Wednesday in KeyBank Center and host Ottawa in their home finale here Thursday night. The season ends Saturday night in Detroit.